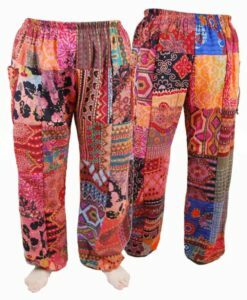 Here at Gaznik Ethically Trading, we stock a huge variety of Trousers, Harem and Alibaba pants. All designs are gender neutral and can be worn by everyone, hippy or not! 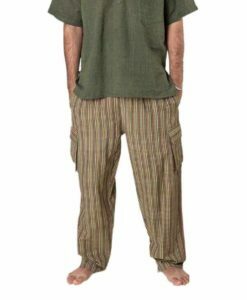 These trousers are so comfortable to wear, that they have multiple uses. Of course, they will come with you on your summer festival adventures, but they are also perfect for lounging around the home, packing away into your suitcase for holidays and in the more subtle colours, even for work! 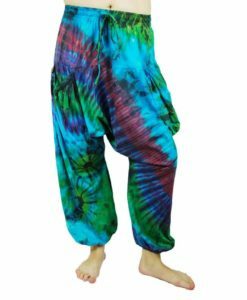 Harems are ancient! Over 2000 years old originating from countries such as India, Nepal and Iran. 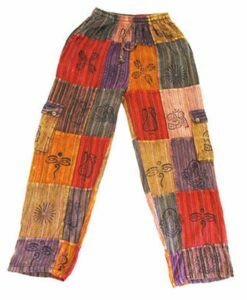 They were designed for both men and women and were a basic design of several metres of cloth wrapped around the legs and tied at the waist. 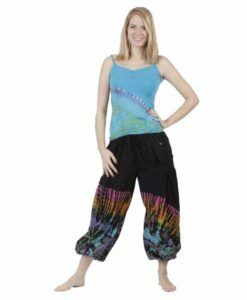 For women, they were worn for modesty, as the baggy trousers hid the body’s natural shape and created a different silhouette. They made a comeback at the turn of the 20th Century when woman were trying to do away with their restrictive corsets and dresses and all the anti-feminist oppression that the masculine dominated societies pushed upon them. 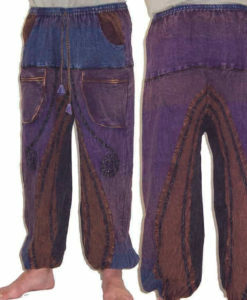 Paris couturier Paul Poiret is credited with introducing the new ‘middle eastern’ design of trousers to women. 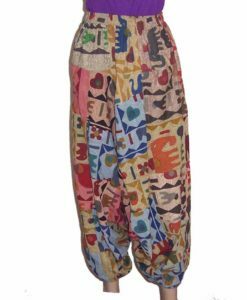 His trousers known as ‘Sultanes’ were elegant and bejewelled and made using colourful flowing silks. Despite Poirets efforts to liberate western women’s fashion, the comeback was short lived. 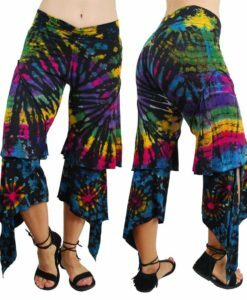 In the 60’s and 70’s the Western World Hippie movement did result in another wave of inspired fashion, but it wasn’t until the early 90’s when MC Hammer brought the crazy baggy trousers back to the world in a big way! Happily, that era has passed…. 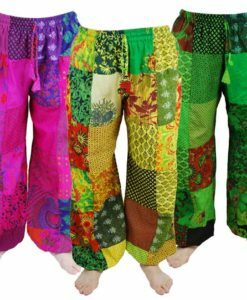 The Harem pants stocked here at Gaznik are all beautifully made in unique patterns and designs and from a variety of materials. 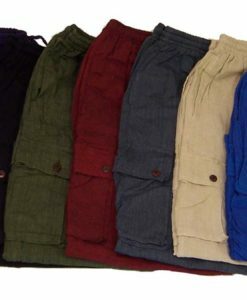 They are designed to be worn by men and women, and are comfortable, stylish and of course, ethically traded. With elasticated waists, baggy legs synched in at the ankle and tighter around the calf, our Harem pants are effortlessly flattering on all body types, creating a beautiful silhouette. 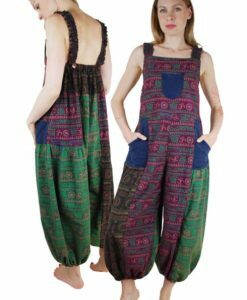 Our styles vary, are often hand-made, hand printed or upcycled from other garments, such as Saris, therefore, each piece differs slightly from the next, making your purchase an individual and unique one. 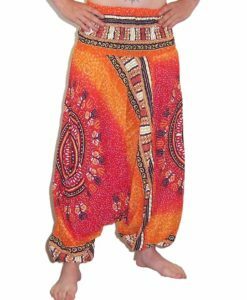 These are very similar in design to Harems except they are generally slightly baggier around the leg and have a much lower ‘dropped crotch’. We stock a wide variety of at Gaznik, ranging from simple elegant designs, to crazy patchwork patterns and everything in-between. 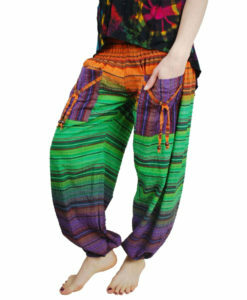 We also stock a variety of other trousers, dungarees and shorts, designed with the Hippy- Boho chic in mind! And that brings us finally to our dungarees. They made the biggest splash of all at our summer festivals this year and are still flying off the rack! 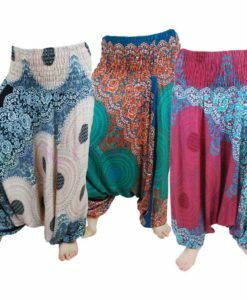 They are definitely one clothing item that will be hanging around for a while yet, and long may they, as they are the cutest, most comfortable clothing item ever!